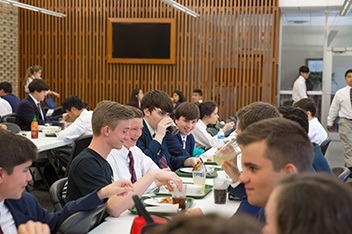 Specializing in K-12 private and independent schools, FLIK Independent School Dining prides itself on providing customized, healthy meals that embrace the issues of sustainability. Unique to FLIK is its Color Your Plate Healthy program, which is a simple, color-coded guide for students to selecting balanced meals. Using fresh ingredients and mouthwatering recipes, chefs limit the use of processed foods, artificial colors, flavorings, M.S.G., preservatives and trans fats. To teach students the importance of a healthy diet and an active lifestyle, the program educates students through in-classroom and in-dining room activities. FLIK meets the diverse dietary requirements of students by offering vegan, vegetarian, Orthodox kosher and halal meals. Through its exceptional catering services, FLIK supports school functions.